This week the children were very interested in sharing the story ‘I Went Walking‘. 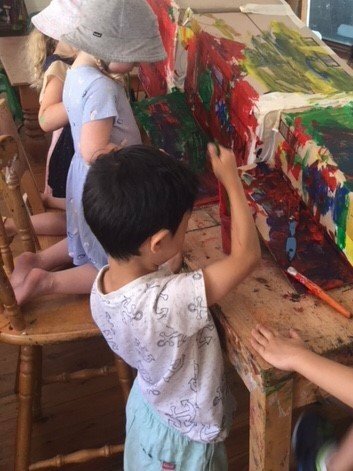 The children were creating farm animals with playdough and singing ‘Old McDonald Had a Farm‘ prior to us sharing the story, so the story was used as an opportunity to build on and extend the children’s existing interest in and knowledge of farm animals. 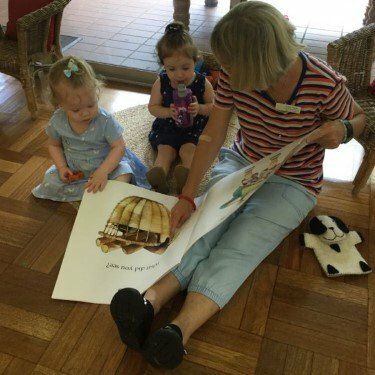 The children were very eager to name each farm animal and to make the animals’ sounds as they appeared in the book’s illustrations. 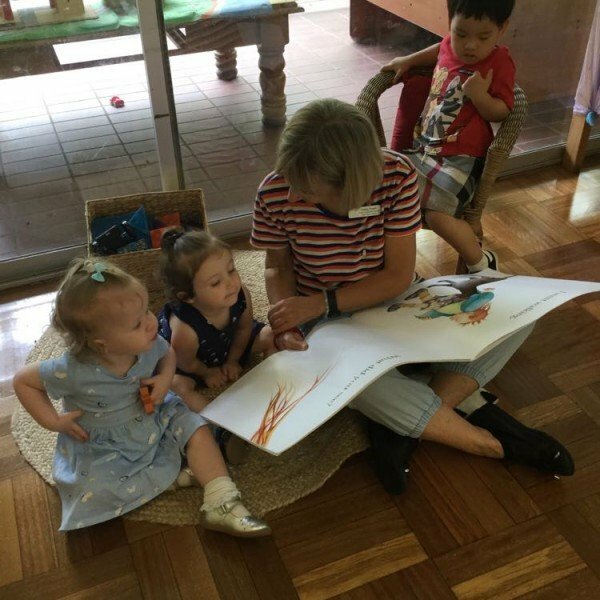 As the children engaged in the experience they had the opportunity to facilitate their language development and literacy skills. This experience also transferred the children’s interest in farm animals from one learning experience (playdough) to another (literacy). 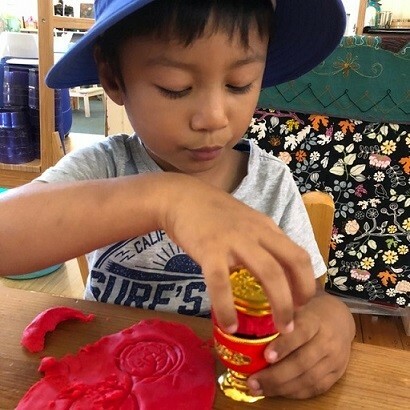 Our educators plan to continue to follow the children’s interest in farm animals, for example by providing playdough experiences with farm animal shapes, and using stories, songs and a farm animal interest area to extend the children’s learning. Chinese New Year celebrations were a fun part of the program in Johnson House this week. 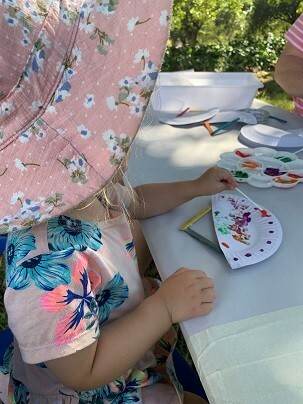 A variety of provisions including lanterns, lucky gold coin and books were provided so that the children could enjoy a ‘hands on’ learning experience about this significant cultural event. 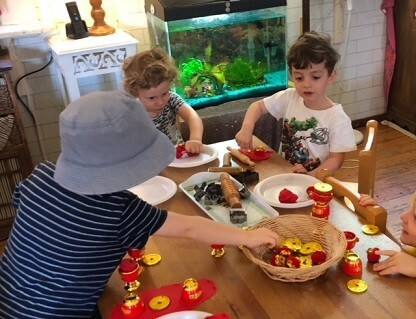 As the week progressed the children were given the opportunity to cook some traditional Chinese foods, create lanterns and design their own lucky red envelope. Through our program our educators help the children to become familiar with a variety of cultures, helping to embed a respect for diversity and inclusion. 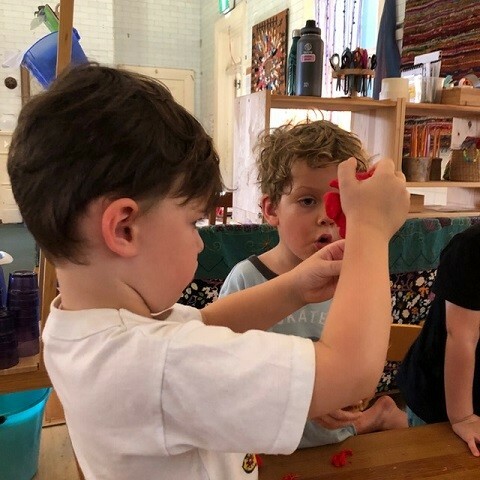 This week, the children in Murray House infants room have been exploring coloured scarves in their schematic play (which is play is where children repeatedly practice different ideas or concepts). 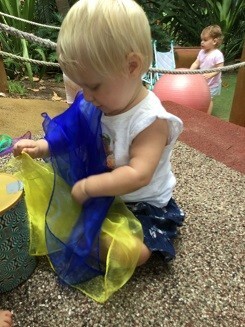 A range of coloured scarves were added to the music corner for children to use during dance and movement, and the children were encouraged to use their ‘big muscles’ to swing the scarves along to the music. 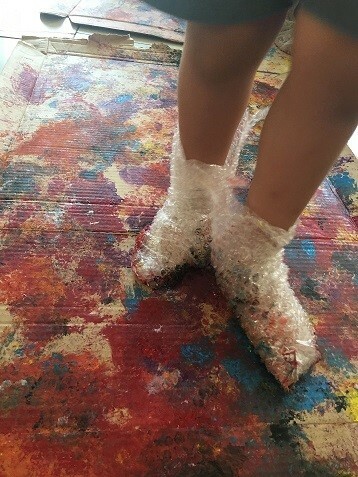 The scarves were also used to play fun games such as ‘peekaboo’, which is a wonderful way for children to explore humor through social engagement. The children covered their faces and pretended to hide, surprising the educators with a “boo!” as they pull the scarves down. Lots of giggles and laughter were heard as the educators pretended to be surprised. A shoe box with a hole in the lid is used to store the scarves. The children seemed to be curious, fascinated and interested as they discovered that the scarves can be pulled out through the hole. 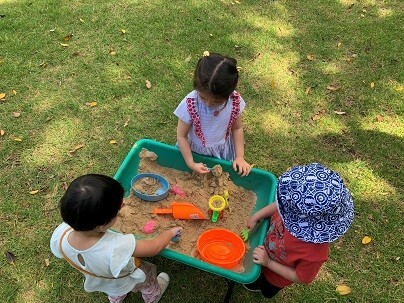 Playing with scarves has offered open-ended opportunities for the children’s learning and exploration, and it also encouraged the use of fine motor skills through grasping and pulling the scarves and integrating sensory exploration in their play. Get well soon, Uncle Terry! The toddlers have noticed that Uncle Terry hasn’t been coming to the centre in the past few weeks. When they learned that Uncle Terry is away due to being unwell, an idea to make a ‘get well soon’ card was suggested by educator Denise. 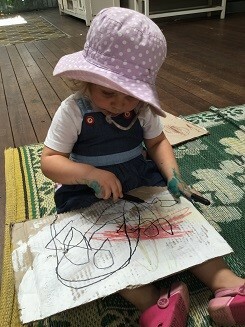 The children were provided with coloured textas, crayons, pencils, and paper to participate in this experience. It was lovely to observe the children’s drawings displaying their sense of creativity and imagination. Some of the children drew subjects relating to Uncle Terry, such as using dots for painting or creating pictures of him. Others preferred to draw things they liked and that they hoped Uncle Terry would like too. Some of the comments the children made as they drew included: “I draw dots for Uncle Terry”, “It’s Uncle Terry”, “I miss Uncle Terry” and “I make cupcakes for Uncle Terry”. 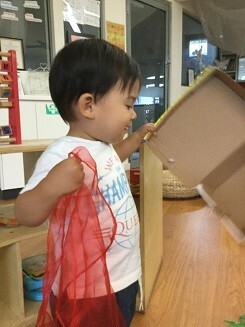 Our young toddlers have been enjoying playing with a variety of different sized boxes. 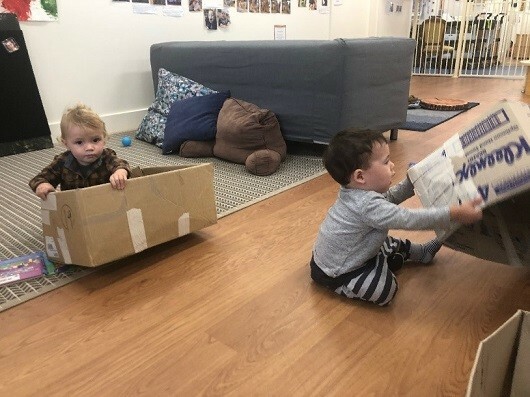 A lot of learning occurs when young children play, explore and experiment with objects such as boxes, as they use their senses to make discoveries and extend their thinking and understanding. 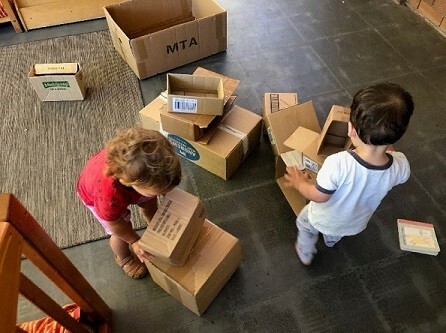 As the children repeatedly fill and empty the boxes, climb in and out of them, carry them around, and find many different ways of playing with them, they’re not just making a mess – they’re exploring concepts such as spatial awareness and the properties of the boxes, helping them to begin to understand concepts such as capacity, volume and space. In their play, the children stacked the boxes, and knocked them down. They carried them around, experimented with putting different objects in them and explored which boxes would fit inside each other. 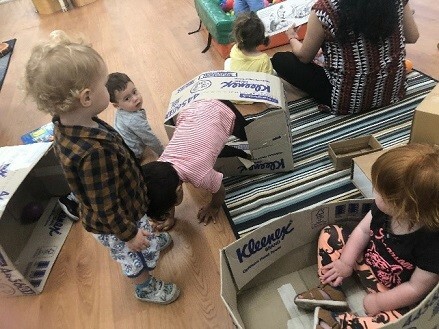 They enjoyed climbing in and out of the boxes and sitting in them, and they discovered how to crawl through them. 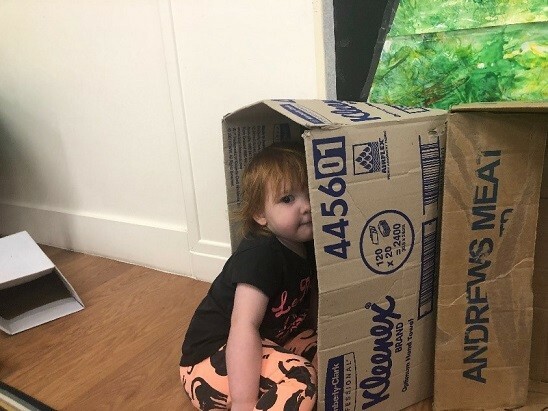 They even found that they are fun to hide in to play ‘peek-a-boo’ with their peers and educators. This week the children at Robinson House have shared stories about seeing dragons dancing in shows, with many celebrations happening for Chinese New Year. The children have shared how they have joined family and friends to celebrate and to eat a range of delicious traditional foods. 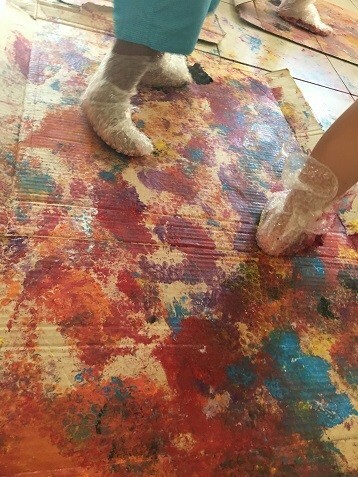 As the stories about the dragon shows continued during the week, the children appeared to be fascinated by the way the dragons moved and how colorful they are. This inspired us to begin creating our own dragon using cardboard boxes and masking tape. We then decided to create a rainbow dragon and painted it with bright colours. 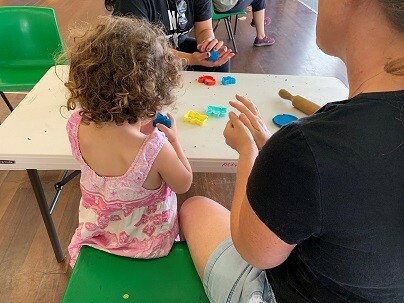 Last week the children in one of our Family Day Care Sydney Wide Inner West services became very interested in the sounds and textures of bubble wrap as they were busily unwrapping items in thee service. 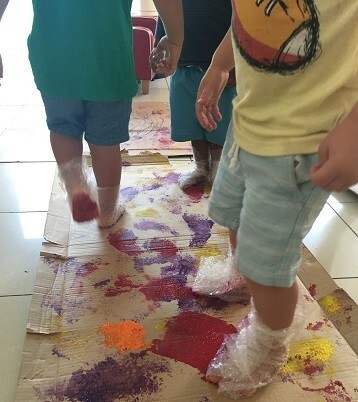 This quickly led to the children excitedly wanting to discover what might occur when paint was added, so they engaged in a creative arts experience where bubble wrap was secured to their feet, paint was added and cause and effect was explored through a variety of different actions. 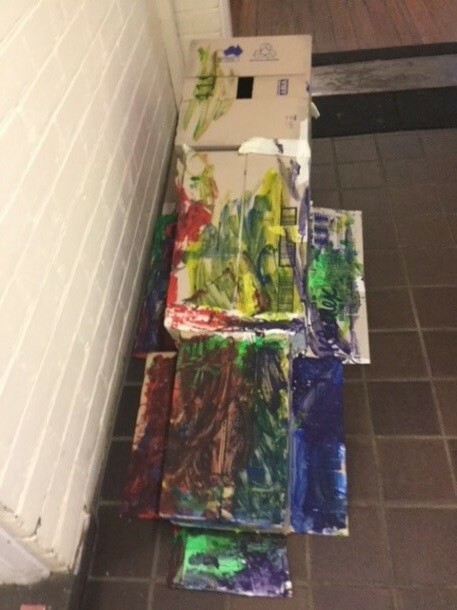 Throughout this combined creative arts and sensory play experience the children had the opportunity to develop gross motor skills, coordination skills, explore patterns and experiment with different concepts around art. 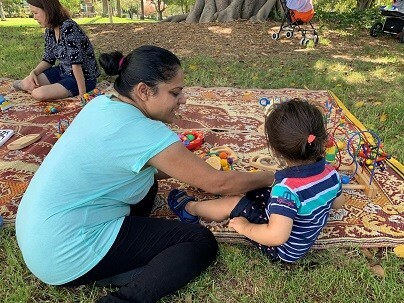 This week we welcomed back all of our existing families, as well as many new families joining us for our 2019 playgroups. We hope you all had a lovely break over the school holidays. 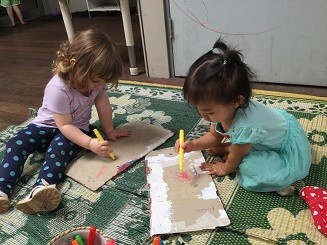 Playgroup is a place for children to play and learn in a safe and supported environment. Playgroups offer fantastic opportunity for parents to meet other parents, grandparents and carers and to share parenting ideas. We have a range of activities planned for the term. 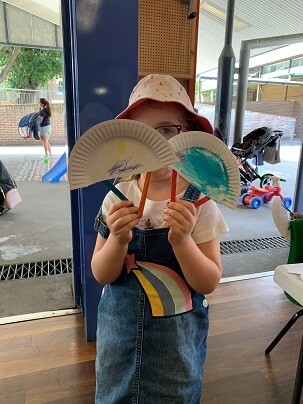 This week we had lots of fun with water and sand play and we made fans. 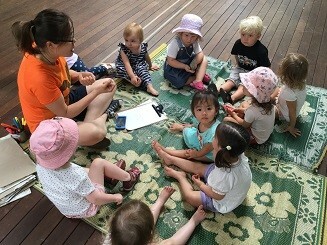 Singing and dancing was enjoyed and we read ‘The smallest bear’ children’s picture book story for group time.